In an earlier blog post I described how future business environments will be more tightly integrated with information flowing from EIM, B2B and IoT based platforms. I outlined how information can be broadly split into structured and unstructured information flows and for this blog entry I just wanted to expand on some of those initial thoughts. EIM, B2B and IoT will collectively provide ‘fuel’ or information for tomorrow’s digital supply chains. Over the past few weeks OpenText has been running a series of events as part of a global Innovation Tour, visiting major cities around the world, to share our vision for the future of Enterprise Information Management. We are using this tour as a platform to introduce our 2020 agenda and managing internal and external enterprise information flows across future digital supply chains will be a core part of this agenda. In parallel with these events, OpenText |GXS hosted our Customer Forum in Washington last week and I was given the opportunity to present my vision of where the manufacturing industry was heading in the future. Tomorrow’s manufacturing industry is going to need to embrace many new and ‘disruptive’ technologies and processes that are just starting to enter the market today. From wearable devices such as Google Glass, 3D Printers, Drone Based Logistics Networks and of course the Internet of Things. Future supply chains will need to embrace these technologies and EIM and B2B platforms will need to process data coming from these devices as part of the overall information flows across a digital supply chain. During my ‘Manufacturing 2020’ presentation I discussed each of these technologies in more detail and provided some real world examples of their applications. It has only been a few weeks since I posted my last blog introducing EIM, B2B and IoT and even during this short period of time the IoT world has moved on and technology has progressed. For example only this week Cisco announced a $1Billion investment to expand their cloud infrastructure which will be used to support the connection of billions of IoT related devices. Cisco’s cloud is being designed from the ground up to support IoT, capable of scaling to billions of connections and trillions of events all supporting real time analytics to help customers get the insights they need from the connections of people, processes, data and things as they happen in real time. At an SAP conference in New York yesterday Cisco and SAP painted their vision for the Internet of Things, especially in relation to manufacturing environments of the future. 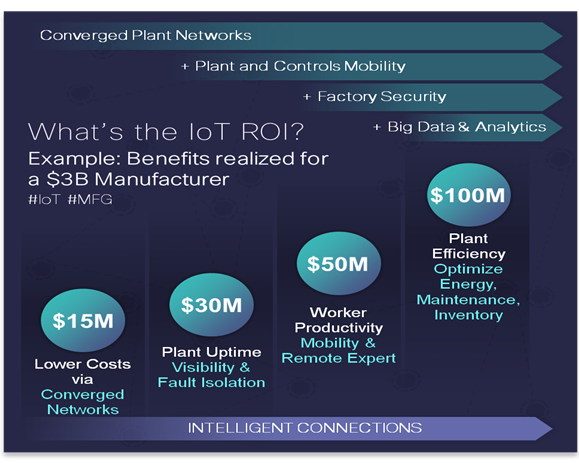 Cisco estimates that improvements to plant automation processes and improved production output from IoT is a potential $2Trillion opportunity over the next ten years. The chart above, courtesy of Cisco, highlights the potential opportunity of IoT in manufacturing. Building a dedicated IoT infrastructure, processing the data coming off of this infrastructure in an in memory database such as SAP HANA is only part of the story. Providing connectivity to a B2B network which can then take actionable decisions and initiate supply chain processes is the next logical step in the evolution of a company’s IoT related digital supply chain strategy. Dedicated APIs will need to be developed to connect Cisco’s network to a B2B network such as OpenText |GXS’s Trading Grid, the world’s largest cloud based integration platform which processes 16billion transactions per year. The API is a critical cornerstone of developing a completely closed loop IoT connected digital supply chain infrastructure. So what exactly will these closed loop, IoT focused business processes look like and how will they help to enable digital supply chains of the future. In the immediate future there are three key areas where IoT can fuel the digital supply chain, namely offering pervasive visibility, proactive replenishment and predictive maintenance. Let me now expand on these with a few real world examples that I have learnt about in recent weeks. Pervasive Visibility – Bosch is currently developing a software based virtual supply chain. The environment will take the output from various RFID and other sensors located across both their factories and their 3PL providers and this will provide a complete end to end view of shipments as they move from point of manufacture to point of delivery. RFID technology has been around for many years but I wonder if the IoT will provide the platform for RFID technology to prosper? Part of the problem that has restricted the growth in RFID adoption has been the lack of a truly global RFID reader infrastructure. The IoT, with billions of connected devices could potentially change this. 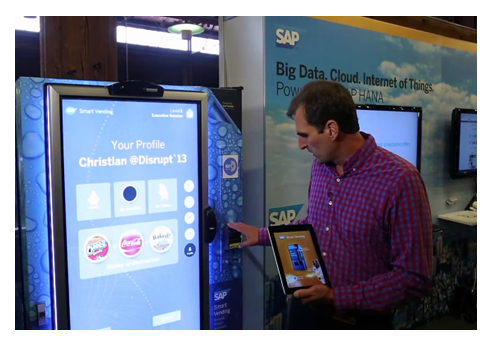 Proactive Replenishment – Last October at Cisco’s Internet of Things World Forum in Barcelona, SAP demonstrated a HANA powered vending machine. Not only could the vending machine recognise a customer using the machine and make suggestions for their next purchase, but it could also potentially highlight out of stock situations with the machine which would lead to new stock needing to be ordered. 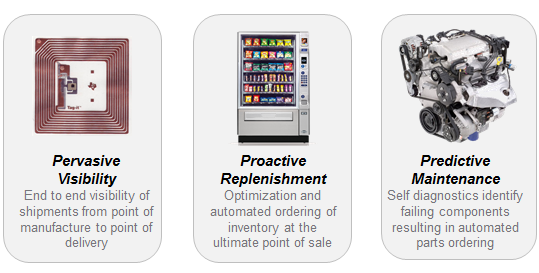 Information on every sale from the vending machine would be stored in an instance of SAP HANA allowing a supplier to monitor consumer buying patterns and trends across a network of internet connected vending machines. This is a very simple example but in the context of a manufacturer this could be applied to aftermarket parts replenishment or monitoring stocks in a warehouse that are used as part of a production process. Predictive Maintenance – I think this area is very interesting as it could potentially tie in with the other trend of the moment, namely 3D printing. Take the following scenario, an aircraft is about to experience a problem with a bracket failure in one of its wing flap mechanisms. The bracket is going to fail due to a hairline crack developing in one arm of the bracket. The original bracket is shown below. What if a strain gauge fitted to the bracket actually detected the crack developing, this information would be transmitted to the destination airport that the aircraft is flying to and a new 3D printed part is manufactured in the maintenance hangar and once heat treated could be fitted to the aircraft when it lands. This is a great example of what I would term a ‘zero length supply chain’. A part has been manufactured there and then with no logistics infrastructure required at all to deliver the part. This would save airlines a significant amount of money, especially in relation to downtime required to normally wait for a part to be shipped to a maintenance hangar which could be located anywhere in the world. Now imagine a similar process happening to repair a car, a military vehicle or any serviceable ‘asset’ that needs to be maintained to a high level in order to maximise the up time of the asset concerned. I have provided three examples above to illustrate where IoT could potentially fuel a digital supply chain. The RFID example could be integrated with an B2B Advanced Ship Notice (ASN) process to notify customers of an inbound delivery. 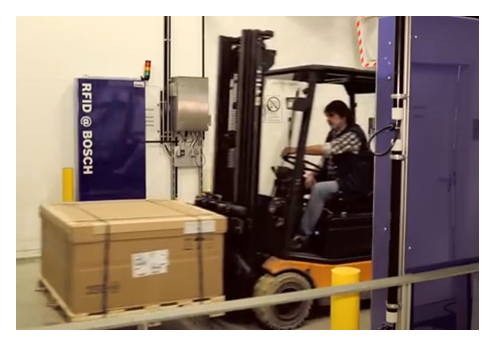 Rather than customers being told that their shipment may be delivered within a 30 minute window, the network of interconnected RFID sensors and readers will paint a real time view of the shipment as it makes its journey from the factory to the point of delivery. As the parts are delivered, inventory levels can be automatically adjusted and the associated invoicing process could be set in motion. The vending machine example would see an automated order being placed with a supplier when the stocks in the machine get too low and the delivery of goods to the machine could be monitored as well. As for the maintenance example, there will inevitably be parts that cannot be 3D printed and therefore either an automated process could be put in place to order new parts or a web portal front end to an online catalogue of replacement parts could be setup. 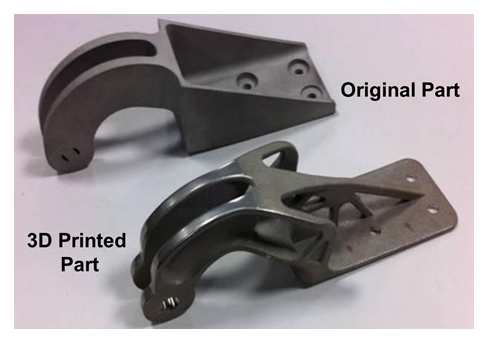 In fact if parts have to be replaced after so many flying hours then maintenance crews could have access to an online catalogue of 3D printable parts, they would simply select and then download the replacement part that they need, as a 3D CAD model, and then print locally on a 3D printer in the maintenance hangar. 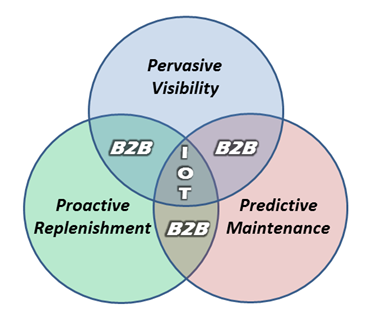 These three processes nicely demonstrate how B2B plays a key part of the whole closed loop process relating to future digital supply chains and in fact these processes are in some cases reliant on each other to operate efficiently. Both replenishment and maintenance scenarios will require visibility, especially when ordering non-3D printable parts such as air filters for example. In some cases maintenance crews will need to make sure they have a ready supply of spare parts so that an aircraft can be repaired as soon as it lands. Being able to automatically replenish spare part related inventories will be key to ensuring that maintenance processes can be undertaken smoothly. 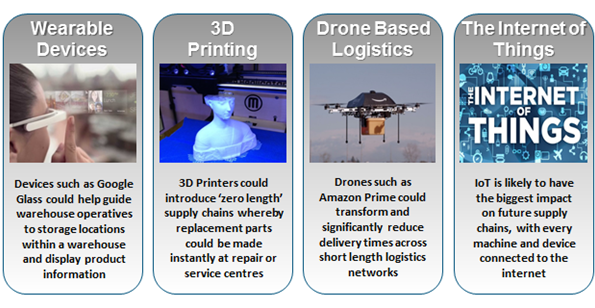 Once again I have only scratched the surface in relation to how IoT will impact digital supply chains of the future and I will look at other areas in future blog posts.